It’s hard to imagine a more ideal job – attending to the needs of happy, smiling passengers aboard a luxury cruise line ship. The sun is shining, the water is blue, and you are in the middle of it with a cold drink in one hand and paycheck in the other. Yes, a job aboard a cruise ship, big or small, has its perks. But opportunities don’t come without research and planning on your part. No doubt about it, you’ll witness tough competition for most positions. With some of the main cruise lines receiving up to 400 resumes a week, job seekers should be prepared to be alternately persistent and patient, while remaining positive. That’s a tall order, especially on top of the pressures of everyday life. Still, there are plenty of opportunities out there for those with the right combination of skills and drive. Heed our advice and immerse yourself into the world of cruising, from its history to its jargon and terms. The more you know, the better prepared you will be to wage a “Hire Me” campaign that yields results. Before the dominance of air travel, which began to enjoy commercial success in the late 1960s, passenger liners were the preferred mode of overseas travel. Ships changed very little during the first half of this century. Although engine efficiency improved, passenger staterooms, public lounges, and deck space on a cruise ship built in the 1950s were not much different than those on the S.S.Titanic. Most of the so-called modern ships plying the waters during this time copied the amenities and grand styling of past steamships. Their purpose remained the same as well. Oceangoing vessels were primarily used to get from point A to point B, especially for second- and third-class passengers, whose accommodations were in stark contrast to those of first-class. The most common sailings were transatlantic crossings from London to New York. You can still visit the original terminal at Tilbury Docks just east of London and image the hustle and bustle of a bygone era. It sits humbly on the tide flats of the Thames, surrounded by the smoke stacks of the city. It was from here that the royal Queen Elizabeth ran continuous service to New York. Similar routes were run by American President Lines across the Atlantic and around the Pacific Rim. In this golden age of ocean liners, ships such as the Lusitania, United States, Ocean Monarch, Paris, Queen Mary, Caronia, and Laconia were sailing the high seas. Every vessel had a unique personality, history, and enough passengers to keep financially afloat. But it wasn’t to last. The real blow to the cruise industry came in the 1960s when the Boeing Company began selling 747s and other aircraft worldwide. Meanwhile, a global transportation network of airports with regulated, common language and air traffic controllers, in coordination with the United States Federal Aviation Administration, was being established. As the decade came to a close, it was no longer fashionable, practical, or economical to travel by boat. The age of jumbo jets had arrived. In 1974, to boost a declining market, Cunard Lines, the company running transatlantic travel service between New York and London with the Queen Elizabeth II, hired international celebrities to perform cabaret acts aboard ship. They advertised the crossing as a vacation/entertainment experience with Las Vegas-caliber shows. The QE2, still one of the fastest passenger liners afloat with a maximum cruising speed of 38 knots, was the perfect vessel to inaugurate these changes. While it was fast enough to whisk passengers from London to New York in just four days, it was elegant enough to stage big productions. The QE2 also ushered in the concept of “one-class” cruising, as the ship’s facilities and amenities were made available to all passengers. Regardless of the staterooms or berths passengers had booked, they enjoyed the same service, menus, entertainment and activities. 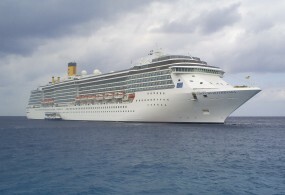 The idea caught on and the general public began taking cruises for short vacations, rather than solely as a means of transportation.